Pickup from Jaipur Airport / Railway Station / Bus Stand by placard carrying driver and transfer to Hotel. Evening free for your activities like shopping etc. over night stay at hotel in Jaipur. Later Drive Back to Jaipur. Over night stay at Hotel. After breakfast drive to Ranthambore. 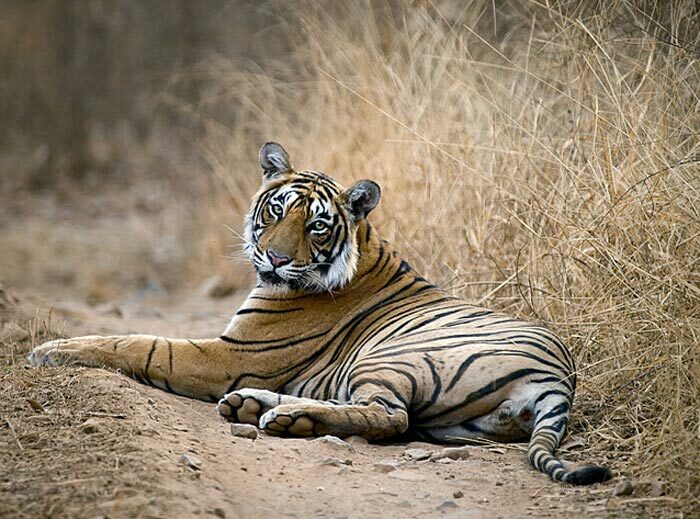 Visit the Wildlife sanctuary and see tigers in their natural habitat. Back to Jaipur for the night. DAY 4: On the last day of the trip, visit the magnificent Amber Palace. See the Largest Cannon on Wheels in the World, and old cannon foundry at Jaigarh. Visit to the Kanak Vrindavan Temple in the valley of flowers. DAY 5: Drop at Airport / Railway Station / Bus Stand. Any personal expenses like laundry, phone, beverages. Any other service that is not mentioned in the inclusion. If you have not decided yet or wants to customize tour itinerary or hotels listed above in "Jaipur-Ajmer-Pushkar with Ranthambore tour from aarchtours", then we can change the travel itinerary and make a personalized, tailor-made holiday package, especially for you. We can modify this travel package as per your itinerary, budget, duration and the tourist places you would like to visit, including transportation and airfare should be included or not. Please fill the form below to contact us.